With all the talk of man cave accessories and what should or should not be incorporated into a man cave, many of us out there are forgetting one of the most important parts – the bar! There are a variety of man cave bar ideas out there, but most people are hesitant on which bars to look at and which are ones to avoid. Whether you want a modern feel or some variation of a wood bar, there are a lot of options out there for you to choose from. Let us take a look at the top 5 man cave bar options that can help boost your man cave to a level unmatched by most! When I think home bar, I think a nice wood finish with multiple drawers and capabilities. The Lambert Bar Unit with Sink Cherry has an amazing poplar wood, birch and metal finishes with a variety of features, allowing it to not only look amazing, but provide a multitude of options as well. The Lambert Bar Unit has the capacity to hold 10 bottles of wine, 4 shelves to hold a variety of bar options, and a weight capacity of 50 pounds. Rather than having a bar that has a single capability like storing a case or two of beer, this bar enables you to hold a variety of alcohol options, plus a storage space in shelving should you decide to add a few snacks as well. Almost forgot….it has an Ice Bin! Most bars lack this feature, but the Lambert Bar Unit has it all in terms of its features and the cost is reasonable considering all you are getting along with it. Add the fact that this comes with a foot rest – meaning you get the trifecta of bars! The only downfall I see with this unit is that it quite bulky and the wood can get water marks. One customer saw this and tried to counter it with some anti-watermark spray, but that started to eat away at the wood. If you don’t mind water marks, or simply want to clean it each time it is used like most of us, then this is the bar for you! For those of you who do not have the time to clean up after each spill, we have a few options for you as well! This is one of the most beautiful bar sets out there. 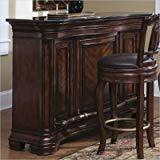 The Pulaski Toscano Vialetto Bar has a gorgeous wood finish topped with a granite counter top on the bar, provide the look of elegance with the luxury of multiple purposes. Rather than having a simple bar with just a bit of storage space, the Pulaski Toscano bar has wine racks, a stationary and adjustable shelf, and three drawers for additional storage. Combine that with a door that locks and you have a true gentleman’s bar in your very own man cave. The only negative I could find in relation to this bar is that there are no bar stools included. With a price range this high, you would think that there would be at least two bar stools included, but alas there are none. The bar itself is worth every penny, but high priced items should in turn equate to a few additives. There is a bit of a benefit to this – you get to choose your own bar stool that matches your overall theme! Lastly, the Pulaski Toscano bar has a curved foot rail finished in a nice brass – topping off the most luxury themed bar stool on our list! Not looking to spend that much money on a bar? Let’s take a look at a few other options in your price range. This is one of our most cost-effective bars out there, giving the overall feel of a man cave at the cost of a blue collar worker. The Steve Silver Company Ariana Bar Table is smaller bar made from tempered glass shelves and a bit of chrome, allowing this bar to blend in with any man cave theme or design. Contrary to most man cave bars, this tempered glass brings the modern look into the room. Wood finished bars have a preset image already built into them, preventing them from fitting into themes pertaining to futuristic, sport, or gaming man caves. Having this glass and chrome bar allows you to serve drinks to yourself and a room full of guests without the overpriced, out-of-place wood finish. Think of it this way, saving a thousand dollars on bar allows you to spend the thousand elsewhere on other memorabilia, an entertainment center, or drinks for the bar! When you think the ideal bar from the old school movies, the 2-door 2-drawer Bar Unit should be at the top of your list. A nice wood look, marble counter top finish, and a metal finish speak to these bars classic look and feel. Starting at the top of the bar, the marble look has the perfect feel of a classic bar, as well as the capability of providing a stain resistant finish without the hassle of constant clean up. Under the marble counter top is where the magic begins- drawers, wine bottle holders, wine glass holders, doors, and tinted drawers. This bar not only holds just a few wine bottles and glasses, but 12 of each! Not a wine fan? No problem – add a few 750ml bottles of your favorite liquors and you save a bit of storage space on the side! With those 12 bottles in the wine bottle area, you have a massive amount of extra storage space to add the rest of your bar products without the look of a hoarder! Although this bar does have an issue in terms of different pieces being delivered at different times, the company is remedying that so it does not happen for most (if not any) cases. Lastly, this bar tends to be the best bang for your buck if you want that wood feel, as it is discounted to a nice price that is cost effective to all man cave bar buyers! 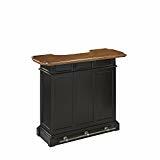 Although this is not the best looking bar on our list, the Home Styles Model Black and Oak Bar has some of the best potential at a cheaper cost. If you want to spend less on a bar for your man cave but still want to keep the wood look, this bar is the best option out there for you. There are four shelves, two of which are adjustable and provide perfect storage capacity for any bottle size you wish to store. Add in the door and storage drawer and you have enough space to house any drinks for your man cave without having to take up too much space in your man cave. There are a few negatives in relation to this bar, ranging from the one drawer and door to the quality of screws to place the bar together. The single drawer and single door may not be an issue for some, as many have man caves that are small in size. If you are looking to convert a smaller room (or even a shed) into a man cave, then the size of this bar and the single door and drawer will not be an issue at all. The screws that come with the bar have been an issue for some, but screws are easily replaceable and can be purchased at any hardware store if that isn’t too much of a hassle. Lastly, the bar itself is light in weight. A lot of the bars on here are heavy, making it harder to move the bar around if you want a different space after a few weeks or months. We all make changes to rooms every now and then, and this bar allows you to do so at little to no strain on your back! The Bar Has Been Raised – Where Do You Stand? With five of the best options out there, which option works for you? Whether you want a classic look of an older wooden bar, or a more modern look of a glass bar, the option you choose will speak volumes to your man cave. You can choose a smaller bar with a single drawer and door, or a larger one capable of holding a plethora of bottles and additional storage space – all at the click of a button. If you have any questions or concerns pertaining to any of the bars listed above, or even experience in using any of them, feel free to leave them in the comment section below! I don’t currently have a Man Cave, but if I did…A Wet Bar would be there for sure! These examples of bars are all nice, but I prefer the classic look of wood. 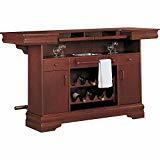 We have built-in wet bars/coffee bars at the beach house, but they are not located in a man cave. I will have to settle for the wet bar in the game room with a view of the Ocean. I too prefer the classic look of wood. Add the fact that wood can match almost any interior and it becomes a win-win all around. Having a wet-bar in a game room isn’t a bad thing either! In terms of the granite top bars, how well do they hold up to citrus? I know it attacks marble, but I’m not sure about granite. The granite top bars do hold up in comparison to granite, as they are mostly acid resistant. The sealant added to the marble countertops are similar to that of what you would find in a household kitchen. Marble and Quartz are becoming the top countertops in this day and age.